…one with eyes lowered as if in prayer and the other looking to the stars. Who are these women? 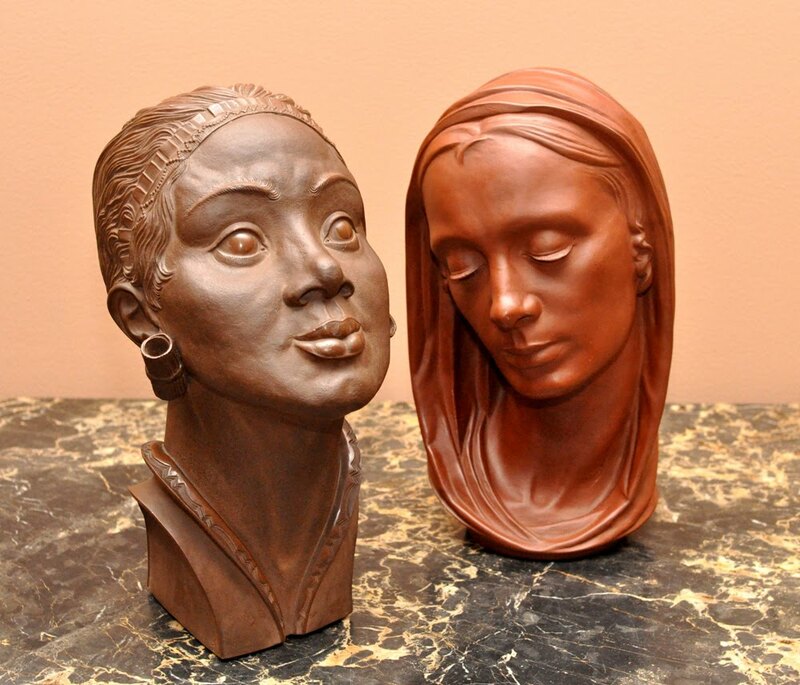 We will never know, for they are not commissioned portrait busts but rather idealized heads based on a sculptor’s study of a live model. 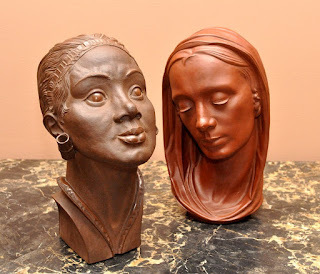 Furthermore, they are not even in the traditional materials of “fine arts”, stone, or bronze. These two dreamers are made of red stoneware known as Böttgerware, and produced at the porcelain factory of Meissen somewhere between the late 1920’s and mid 1930’s. Their authors were sculptors who made their living creating models for ceramic production. These sculptural studies are a world apart from the precious quality generally associated with porcelain figurines. But modelers for porcelain factories of the 18th century were often talented sculptors (Kaendler at Meissen, Bustelli at Nymphenburg foremost among them) who could shape the human figure to conform to the stylization of the Baroque and Rococo eras. Just so with these two heads, where the realistic study of models is transformed through the lens of the Art Deco style of the twenties and thirties. We know little about the sculptors themselves. Professor Emile Paul Börner (1888-1970) studied in Florence and the Italian tradition of the depiction of the Virgin Mary is evident in the mystical tranquility he evokes in his female subject. Even less is known about Willi Münch-Khe (1885-1961), the author of the Balinese beauty, who worked as a modeler at several other German factories as well as at Meissen. He clearly shared in the fascination with the exotic that was current in the art deco and moderne periods. They both realized the potential of the high-fired red-brown ceramic that had been overlooked in the centuries since it was developed by the alchemist Johann Friedrich Böttger (1682-1719) in his attempts to produce porcelain for the princely patrons of the Meissen factory. He was the first in Europe to discover the formula for true porcelain known from oriental imports and Meissen began production in 1710. But the early vessels of red stoneware, now dubbed Bottgerware, are among the most prized by collectors today. The exceptionally hard medium allows for the most refined detail and the contrast of matte and highly polished surfaces (see the eyelashes on Borner’s piece, the glistening lips on Münche-Khe’s) Did the director of the factory encourage the two sculptors to explore the medium in large sculpture? Did the two sculptors challenge each other? I have been so intrigued by my two ladies, their relationship and their contrasting beauty. They are hors de categorie, surpassing the stigma of “minor arts” associated with the products of porcelain factories. Will we ever know the circumstance of their creation?